Realistic proportions and faceted look make for a convincing and stylish model. 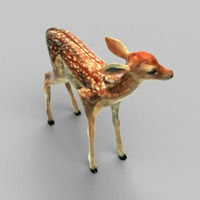 The low poly model is derived from scandata of a high poly model, also available here. Model is watertight, can be 3D printed and comes in OBJ Format. It has UV's and thus can be used in renders with custom texures as well. I hope you have as much fun as I had making it.